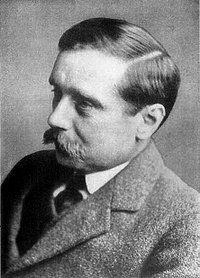 Herbert George Wells (September 21, 1866 – August 13, 1946), better known as H. G. Wells, was an English writer best known for such science fiction novels as The Time Machine, The War of the Worlds, The Invisible Man, and The Island of Doctor Moreau. He was a prolific writer of both fiction and non-fiction, and produced works in many different genres, including contemporary novels, history, and social commentary. He was also an outspoken socialist. His later works become increasingly political and didactic, and only his early science fiction novels are widely read today. Wells, along with Hugo Gernsback and Jules Verne, is sometimes referred to as "The Father of Science Fiction". Herbert George Wells, the fourth and last child of Joseph Wells (a former domestic gardener, and at the time shopkeeper and cricketer) and his wife Sarah Neal (a former domestic servant), was born at Atlas House, 47 High Street, Bromley, in the county of Kent. The family was of the impoverished lower-middle-class. An inheritance had allowed them to purchase a china shop, though they quickly realized it would never be a prosperous concern: the stock was old and worn out, the location poor. They managed to earn a meagre income, but little of it came from the shop. Joseph sold cricket bats and balls and other equipment at the matches he played at, and received an unsteady amount of money from the matches, since at that time there were no professional cricketers, and payment for skilled bowlers and batters came from voluntary donations afterwards, or from small payments from the clubs where matches were played. A defining incident of young Wells's life is said to be an accident he had in 1874, when he was seven years old, which left him bedridden with a broken leg. To pass the time he started reading, and soon became devoted to the other worlds and lives to which books gave him access; they also stimulated his desire to write. Later that year he entered Thomas Morley's Commercial Academy, a private school founded in 1849 following the bankruptcy of Morley's earlier school. The teaching was erratic, the curriculum mostly focused, Wells later said, on producing copperplate handwriting and doing the sort of sums useful to tradesmen. Wells continued at Morley's Academy until 1880. In 1877 another accident had affected his life, when his father, Joseph Wells, fractured his thigh. The accident effectively put an end to Joseph's career as a cricketer, and his earnings as a shopkeeper were not enough to compensate for the loss. No longer able to support themselves financially, the family instead sought to place their boys as apprentices to various professions. From 1881 to 1883 Wells had an unhappy apprenticeship as a draper at the Southsea Drapery Emporium. His experiences were later used as inspiration for his novels The Wheels of Chance and Kipps, which describe the life of a draper's apprentice as well as being a critique of the world's distribution of wealth. Wells's mother and father had never got along with one another particularly well (she was a Protestant, he a free thinker), and when she went back to work as a ladies maid (at Uppark, a country house in Sussex) one of the conditions of work was that she would not have space for husband or children; thereafter, she and Joseph lived separate lives, though they never divorced and neither ever developed any other liaison. Wells not only failed at being a draper, he also failed as a chemist's assistant and had bad experiences as a teaching assistant, and each time he would arrive at Uppark - "the bad shilling back again!" as he said - and stay there until a fresh start could be arranged for him. Fortunately for Wells, Uppark had a magnificent library in which he immersed himself. In 1883, Wells's employer dismissed him, claiming to be dissatisfied with him. The young man was reportedly not displeased with this ending to his apprenticeship. Later that year, he became an assistant teacher at Midhurst Grammar School, in West Sussex, until he won a scholarship to the Normal School of Science (later the Royal College of Science, now part of Imperial College, London) in London, studying biology under T. H. Huxley. As an alumnus, he later helped to set up the Royal College of Science Association, of which he became the first president in 1909. Wells studied in his new school until 1887 with an allowance of twenty-one shillings a week thanks to his scholarship. He soon entered the Debating Society of the school. These years mark the beginning of his interest in a possible reformation of society. At first approaching the subject through studying The Republic by Plato, he soon turned to contemporary ideas of socialism as expressed by the recently formed Fabian Society and free lectures delivered at Kelmscott House, the home of William Morris. He was also among the founders of The Science School Journal, a school magazine which allowed him to express his views on literature and society. The school year 1886-1887 was the last year of his studies. Having previously successfully passed his exams in both biology and physics, his lack of interest in geology resulted in his failure to pass and the loss of his scholarship. Wells was left without a source of income. His aunt Mary, a cousin of his father, invited him to stay with her for a while, so at least he did not face the problem of housing. During his stay with his aunt, he grew interested in her daughter, Isabel. In 1891 Wells married his cousin Isabel Mary Wells, but left her in 1894 for one of his students, Amy Catherine Robbins, whom he married in 1895. He had two sons by Amy: George Philip (known as 'Gip') in 1901 and Frank Richard in 1903. During his marriage to Amy, Wells had liaisons with a number of women, including the American birth control activist Margaret Sanger. In 1909 he had a daughter, Anna-Jane, with the writer Amber Reeves , whose parents William and Maud Pember Reeves he had met through the Fabian Society, and in 1914, a son, Anthony West, by the novelist and feminist Rebecca West, twenty-six years his junior. In spite of Amy Catherine's knowledge of some of these affairs, she remained married to Wells until her death in 1927. Wells also had liaisons with Odette Keun and Moura Budberg. "I was never a great amorist," Wells wrote in Experiment in Autobiography (1934), "though I have loved several people very deeply." As one method of self-expression, Wells tended to sketch. One common location for these sketches were the endpapers and title pages of his own books, and they covered a wide variety of topics, from political commentary, to his feelings toward his literary contemporaries, to his current romantic interests. During his marriage to Amy Catherine, whom he nicknamed Jane, he sketched a considerable number of pictures, many of them being overt comments on their marriage. It was during this period, and this period only, that he called his sketches "picshuas." These picshuas have been the topic of study by Wells scholars for many years, and recently a book was published on the subject. Seeking a more structured way to play war games, Wells wrote Floor Games (1911) followed by Little Wars (1913). Little Wars is recognised today as the first recreational wargame and Wells is regarded by gamers and hobbyists as "the Father of Miniature Wargaming." Wells' first bestseller was Anticipations (1901). When originally serialised in a magazine it was subtitled, "An Experiment in Prophecy", and is considered his most explicitly futuristic work. Anticipating what the world would be like in the year 2000, the book is interesting both for its hits (trains and cars resulting in the dispersion of population from cities to suburbs; moral restrictions declining as men and women seek greater sexual freedom; the defeat of German militarism, and the existence of a European Union) and its misses (he did not expect successful aircraft before 1950, and averred that "my imagination refuses to see any sort of submarine doing anything but suffocate its crew and founder at sea"). Statue of a War of the Worlds tripod, erected as a tribute to H. G. Wells in Woking town centre, UK. His early novels, called "scientific romances", invented a number of themes now classic in science fiction in such works as The Time Machine, The Invisible Man, and The War of the Worlds (which have all been made into films) and are often thought of as being influenced by the works of Jules Verne. He also wrote other, non-fantastic novels which have received critical acclaim, including the satire on Edwardian advertising Tono-Bungay and Kipps. Wells also wrote several dozen short stories and novellas, the best known of which is "The Country of the Blind" (1911). Besides being an important occurrence of blindness in literature, this is Wells's commentary on humanity's ability to overcome any inconvenience after a few generations and think that it is normal. Though Tono-Bungay was not a science-fiction novel, radioactive decay plays a small but consequential role in it. Radioactive decay plays a much larger role in The World Set Free (1914). This book contains what is surely his biggest prophetic "hit." Scientists of the day were well aware that the natural decay of radium releases energy at a slow rate over thousands of years. The rate of release is too slow to have practical utility, but the total amount released is huge. Wells' novel revolves around an (unspecified) invention that accelerates the process of radioactive decay, producing bombs that explode with no more than the force of ordinary high explosive— but which "continue to explode" for days on end. "Nothing could have been more obvious to the people of the earlier twentieth century," he wrote, "than the rapidity with which war was becoming impossible... [but] they did not see it until the atomic bombs burst in their fumbling hands." Leó Szilárd acknowledged that the book inspired him to theorise the nuclear chain reaction. Wells also wrote nonfiction. His bestselling two-volume work, The Outline of History (1920), began a new era of popularized world history. It received a mixed critical response from professional historians, but was praised by Arnold J. Toynbee as the best introductory history available. Many other authors followed with 'Outlines' of their own in other subjects. Wells reprised his Outline in 1922 with a much shorter popular work, A Short History of the World, and two long efforts, The Science of Life (1930) and The Work, Wealth and Happiness of Mankind (1931). The 'Outlines' became sufficiently common for James Thurber to parody the trend in his humorous essay, "An Outline of Scientists" — indeed, Wells' Outline of History remains in print with a new 2005 edition, while A Short History of the World has been recently reedited (2006). From quite early in his career, he sought a better way to organize society, and wrote a number of Utopian novels. Usually starting with the world rushing to catastrophe, until people realise a better way of living: whether by mysterious gases from a comet causing people to behave rationally (In the Days of the Comet), or a world council of scientists taking over, as in The Shape of Things to Come (1933, which he later adapted for the 1936 Alexander Korda film, Things to Come). This depicted, all too accurately, the impending World War, with cities being destroyed by aerial bombs. He also portrayed social reconstruction through the rise of fascist dictators in The Autocracy of Mr Parham (1930) and The Holy Terror (1939). Wells contemplates the ideas of nature vs. nurture and questions humanity in books like The Island of Doctor Moreau. Not all his scientific romances ended in a happy Utopia, as the dystopian When the Sleeper Wakes (1899, rewritten as The Sleeper Awakes, 1910) shows. The Island of Doctor Moreau is even darker. The narrator, having been trapped on an island of animals vivisected (unsuccessfully) into human beings, eventually returns to England; like Gulliver on his return from the Houyhnhnms, he finds himself unable to shake off the perceptions of his fellow humans as barely civilised beasts, slowly reverting back to their animal natures. Wells also wrote the preface for the first edition of W. N. P. Barbellion's diaries, The Journal of a Disappointed Man, published in 1919. Since "Barbellion" was the real author's pen-name, many reviewers believed Wells to have been the true author of the Journal; Wells always denied this, despite being full of praise for the diaries, but the rumours persisted until Barbellion's death later that year. In 1927, Florence Deeks sued Wells for plagiarism, claiming that he had stolen much of the content of The Outline of History from a work, The Web, she had submitted to the Canadian Macmillan Company, but who held onto the manuscript for eight months before rejecting it. Despite numerous similarities in phrasing and factual errors, the court found Wells not guilty. In 1938, he published a collection of essays on the future organisation of knowledge and education, World Brain, including the essay, "The Idea of a Permanent World Encyclopaedia." Near the end of the Second World War, Allied forces discovered that the SS had compiled lists of intellectuals and politicians slated for immediate liquidation upon the invasion of England in the abandoned Operation Sea Lion. The name "H.G. Wells" appeared high on the list for the "crime" of being a socialist. Wells, as president of the International PEN (Poets, Essayists, Novelists), had already angered the Nazis by overseeing the expulsion of the German PEN club from the international body in 1934 following the German PEN's refusal to admit non-Aryan writers to its membership. Wells called his political views socialist, but he occasionally found himself at odds with other socialists. He was for a time a member of the Fabian Society, but broke with them as he intended them to be an organization far more radical than they wanted. He later grew staunchly critical of them as having a poor understanding of economics and educational reform. He also ran as a Labour Party candidate for London University in 1922 and 1923, but even at that point his faith in that party was weak or uncertain. His most consistent political ideal was the World State. He stated in his autobiography that from 1900 onward he considered a world-state inevitable. The details of this state varied but in general it would be a planned society that would advance science, end nationalism, and allow people to advance solely by merit rather than birth. He also was consistent that it must not be a democracy. He stated that in the same period he came to realize a world-state was inevitable he realized that parliamentary democracy as then practiced was insufficient. Wells remained fairly consistent in rejection of a world-state being a parliamentary democracy and therefore during his work on the United Nations Charter he opposed any mention of democracy. He feared that the average citizen could never be educated or aware enough to decide the major issues of the world. Therefore he favored the vote be limited to scientists, organizers, engineers, and others of merit. At the same time he strongly believed citizens should have as much freedom as they could without consequently restricting the freedom of others. These values came under increasing criticism from the 1920s and afterwards. That said, he remained confident of the inevitability of a planned world state well into the 1930s. Lenin's attempts at reconstructing the shattered Russian economy, as his account of a visit (Russia in the Shadows; 1920) shows, also related towards that. This is because at first he believed Lenin might lead to the kind of planned world he envisioned. This despite the fact that he was a strongly anti-Marxist socialist who would later state that it would've been better if Karl Marx was never born. The leadership of Joseph Stalin led to a change in his view of the Soviet Union even though his initial impression of Stalin himself was mixed. He disliked what he saw as a narrow orthodoxy and obdurance to the facts in Stalin. However he did give him some praise saying, "I have never met a man more fair, candid, and honest" and making it clear that he felt the "sinister" image of Stalin was unfair or simply false. Nevertheless he judged Stalin's rule to be far too rigid, restrictive of independent thought, and blinkered to lead toward the Cosmopolis he hoped for. In the end his contemporary political impact was limited. His efforts to help form the League of Nations became a disappointment as the organization turned out to be a weak one unable to prevent World War II. The war itself increased the pessimistic side of his nature. In his last book Mind at the End of its Tether (1945) he considered the idea that humanity being replaced by another species might not be a bad idea. He also came to call the era "The age of frustration." He spent his final years venting this frustration at various targets from the Roman Catholic Church to a neighbour who erected a large sign to a servicemen's club. As he devoted his final decades toward causes which were largely rejected by contemporaries, this caused his literary reputation to decline. One critic complained: "He sold his birthright for a pot of message"
In his lifetime and after his death, Wells was considered a prominent socialist thinker. In later years, however, Wells's image has shifted and he is now thought of simply as one of the pioneers of science fiction; Newt Gingrich, former Speaker of the United States House of Representatives and staunch Republican, praised Wells in his book To Renew America, writing "Our generation is still seeking its Jules Verne or H.G. Wells to dazzle our imaginations with hope and optimism". Apparently a reference to his novels that became true, his gravestone reads Damn you all: I told you so. The novel The Time Ships, by British author Stephen Baxter, was designated by the Wells estate as an authorised sequel to The Time Machine, marking the centenary of its publication, and features characters, situations and technobabble from several of Wells' stories, as well as a representation of Wells (unnamed, and referred to as 'my friend, the Author'). In C. S. Lewis' novel That Hideous Strength, the character Jules is a caricature of Wells, and much of Lewis' science fiction was written both under the influence of Wells and as an antithesis to his work. The devoutly Christian Lewis was especially incensed at Wells' The Shape of Things to Come where a future world government systematically persecutes and completely obliterates Christianity (and all other religions), which the book presents as a positive and vitally necessary act. Arthur Sammler, the main character of Saul Bellow's Mr. Sammler's Planet, knew Wells, and is urged by other characters to use that fact as the basis for writing a biography of Wells, a project about which Holocaust survivor and a self-made philosopher Sammler has decidedly mixed feelings. Wells appears as the protagonist in the 1979 film Time After Time, and in the novel The Martian War by Kevin J. Anderson (as "Gabriel Mesta"). Both works use the conceit that Wells' works were based upon actual adventures he had. In an episode of Lois & Clark: The New Adventures of Superman, entitled Tempus Fugitive, a time-traveling H.G. Wells (Terry Kiser) seeks out Superman's help to stop a criminal from the future whom Wells had accidentally unleashed on the present. The concept of Wells' time machine being stolen and used for evil closely resembles the plot of Time After Time. Both H.G. Wells and the criminal Tempus returned for two later episodes. In the Disney Channel series Phil of the Future, the title character attends a fictional school named H.G. Wells Junior High, the name of the school possibly drawn from the show's science fiction manner. In Ben Bova's short story "Inspiration", the narrator gets Wells to meet a young Albert Einstein and Lord Kelvin. in the end of the story he (Wells) gave a tip to a 6 year old Adolf Hitler. A young and excitable H.G. Wells appears in an episode of Doctor Who, entitled Timelash, though for most of the episode he is cast simply as Herbert. The movie Librarian:Quest for The Spear, ends with the main character, Flynn Carsen, getting a mission to retrieve HG Wells' Time Machine. This Misery of Boots (1907), reprinted from the Independent Review, Dec. 1905. H. G. Wells crater on the far side of the Moon is named for him. ^ Adam Charles Roberts(2000), "The History of Science Fiction": Page 48 in Science Fiction, Routledge, ISBN 0-415-19204-8. Others who are popularly called the "Father of Science Fiction" include Hugo Gernsback and Jules Verne, see the list of people known as father or mother of something. ^ Parrinder, Patrick (2004). Oxford Dictionary of National Biography. Oxford University Press. ^ a b c ThinkQuest Library. H.G. Wells Biography. ^ University of Illinois News Bureau, December 2001. New biography on H.G. Wells focuses on late-life loves. ^ Pegasos - A Literature Related Resource Site. H(erbert) G(eorge) Wells (1866-1946). ^ Rinkel, Gene and Margaret. The Picshuas of H.G. Wells : A burlesque diary. Urbana : University of Illinois Press, 2006. ISBN 0-252-03045-1 (cloth : acid-free paper). ^ The Miniatures Page. The World of Miniatures - An Overview. ^ World Transhumanist Association. Herbert George Wells. ^ An Experiment in Autobiography 556. Also chapter four of Future as Nightmare: H. G. Wells and the Anti-Utopians by Mark Robert Hillegas. ^ Encyclopedia Americana vol. 28 p. 616 and The Scientific Romance in Britain: 1890-1950 by Brian Stableford. Also The "pot of message" remark comes from a 1948 Theodore Sturgeon short story entitled Unite and Conquer, a character in the story was quoting a "Dr. Pierce". ^ Gingrich, Newt. To Renew America. New York: HarperCollins, 1995. p. 189. Gilmour, David. The Long Recessional: The Imperial Life of Rudyard Kipling. New York: Farrar, Straus and Giroux, 2002 (paperback, ISBN 0-374-18702-9); 2003 (paperback, ISBN 0-374-52896-9). Gomme, A.W. Mr. Wells as Historian. Glasgow: MacLehose, Jackson, and Co., 1921. Bolesław Prus, regarding Prus' review of Wells' Anticipations.